The root and rhizome of perennial herb Boehmeria nivea (L.) Gaud. of family Boehmeriae. South China, southwest China, mainly in Jiangsu, Zhejiang, Anhui provinces in China. Collected in spring and winter. Light smell and bland taste. Grayish brown color, not hollow inside. Washed and dried in the sun; sliced and unprocessed. Sweet, cold; heart and liver meridians entered. Cool blood to stop bleeding, prevent abortion, clear heat and relieve toxicity. 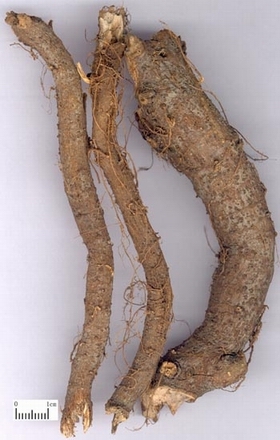 This herb is cold in nature, enters the blood system, and has the action of cooling blood and stopping bleeding. Therefore, it is indicated for various bleeding caused by blood heat. It can be used singly in decoction when the bleeding is not severe. It is combined with other blood-cooling hemostatics when the illness is severe. For continual bleeding associated with the signs of collapse qi due to hemorrhage, it is combined with the signs of collapse of qi due to hemorrhage, it is combined with Ren Shen that can strongly tonify qi to rescue from the collapse in Zhu Gen San from Sheng Ji Zong Lu. 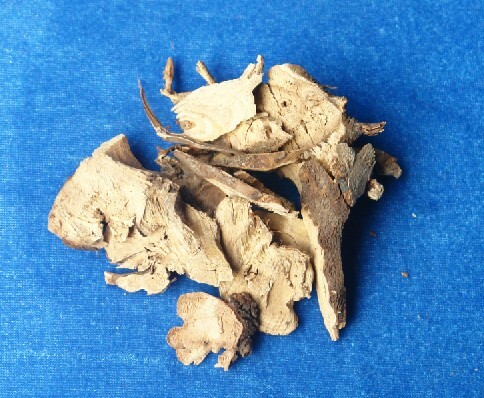 This herb not only stops bleeding but clears heat, favorable to threatened abortion due to fetus heat and vaginal bleeding during pregnancy. For abdominal pain and vaginal bleeding during pregnancy, it is decocted singly recorded in Mei Shi Fang (Mei Shi's Prescription). For threatened abortion caused by blood-deficiency and damage due to overstrain, it is combined with herbs that can nourish blood and prevent abortion. For instance it is combined with E Jiao, Dang Gui, and Bai Shao, etc. in Zhu Gen Tang from Xiao Pin Fang (Small Prescriptions). It is cold in nature and can clear heat and relieve toxicity. So it is indicated for abscess and swelling due to heat-toxin. It is mainly used externally and pounded into paste to be applied on the affected area. Decoct 15~30 g and orally take the juice pounded by 30~60 s of the fresh. Proper dose is used externally, or made decoction for washing, or pounded into paste applied externally.